Sarah Tompkins and Hubert McCabe, two 30-something farmers, recently bought 90 acres in Searsmont from Lynda and Gerry Atwell, a retired couple who had lived on the land for 22 years. The two couples worked with Maine Farmland Trust to place an easement on the property, making it a more affordable transaction and ensuring that it will remain a working farm far into the future. Sarah and Hubert are now happily settled and growing over 200 varieties of greens, edible flowers and vegetables, raising chickens, cultivating a huge number of unique fruiting trees, and they also plan to add pastured livestock in the next few years. When I arrive at Fine Line Farm, Rosie, the adorable cattle dog and “official farm mascot” runs out to greet me. For the rest of my visit she’s at our heels with a stick, hoping someone throws it for her. Sarah and Hubert immediately start out into the fields and I follow. 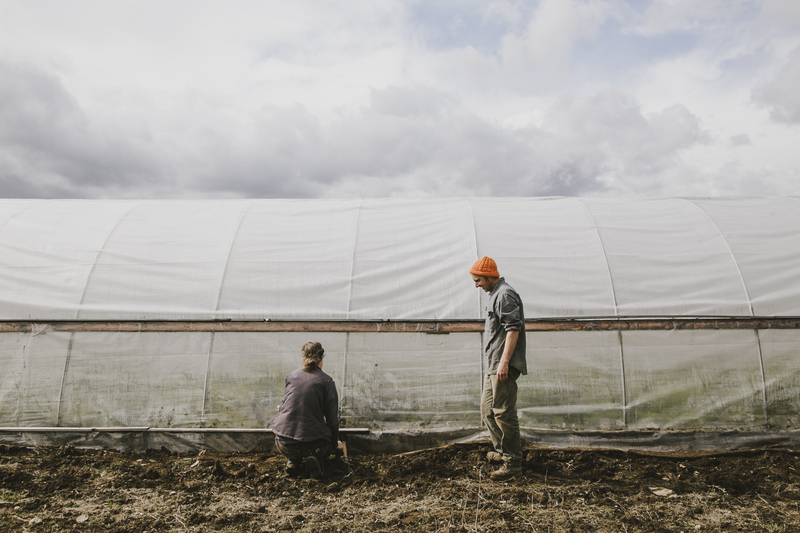 We swing by their two hoop houses, which are warm, fragrant and full of greens and seedlings. They water, I ask questions and Rosie sneaks in before she’s banished back to the doorway. We continue into the fields, through 10 acres of plowed and closely seeded rows. About three acres are dedicated to produce and the rest are cover cropped with rye, vetch, oats and peas. These are rotated to improve soil fertility as their plan is to grow more on less, optimizing both soil and space. They plant what they love to eat themselves, and what their friends, many of whom are chefs, ask for. They’re in constant motion, as there’s always something to be done. I follow them from field to hoop house, to barn, to packing space, then back to the barn, to the fields and the hoop house. I munch on amazing greens with the most incredible flavor, extra special after a long winter, and I listen to Sarah describe their favourite meal these days, which inspires me to go home and make their arugula risotto with cream, white wine, garlic, homemade vegetable stock, served over poached eggs, which they have in abundance from their 60 chickens. The chickens not only provide eggs, they’re also helping in the next phase of the farm’s growth: turning the remaining 30 acres of rolling back fields into pasture for sheep, which will “close the loop” and allow for more fertile and productive growing; another way to “grow more on less” and maximize production and quality. Sarah and Hubert met in Brooklyn, NY at The Chicken Hut, an old feather processing plant, now an art/punk/bike-building warehouse. They eventually left the city to farm in the Hudson Valley, but when they started to think about buying their own land, the only place they really wanted to be was Maine. 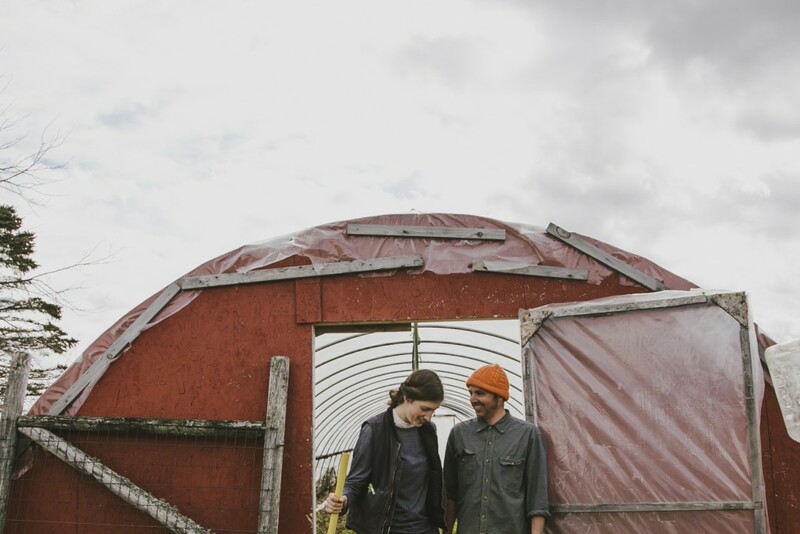 Sarah got a job at Haystack on Deer Isle, where she had previously attended workshops, and they began seriously looking for land through Maine FarmLink. At the same time, Gerry and Lynda Atwell had decided it was time to sell their home in Searsmont. It was a tough decision. They loved the land and all the happy memories there; growing and preserving their own food, hunting, fishing, and hosting a steady stream of family and friends. Lynda said it was like running an inn and they loved it. It was of the utmost importance for both of them that the land stay as it was and remained in good hands, so they decided to work with MFT to actively protect their property. They realized they could make it affordable for young farmers who felt the same way, and when they met Sarah and Hubert, both couples felt an immediate connection. Lynda remembers one of their first visits fondly: “It was raining cats and dogs, but they wanted to check the soil, so they tromped out into the fields in their boots, so excited, not at all bothered by how soaking wet they were” she recalls. That was the moment she knew they would be wonderful caretakers of her beloved land. Sarah and Hubert remember that day as well and Sarah said when they came back, completely soaked through, Lynda had made cookies for them. They told me that the only drawback to buying their land from the Atwell’s was it meant they couldn’t be neighbors! This means they were able to protect the land while retaining the freedom and flexibility to grow and adapt as needed, which is crucial for the future of a working farm. Protecting the land and planning for a future well beyond them is also what Sarah and Hubert are doing by planting many different varieties of trees that they’ll never actually see bearing fruit. Hazelnuts, chestnuts, sugar maples; these are trees that future generations who farm the land will reap the benefits of. But they’ve planted them now, in part because “they’re pretty trees” says Hubert, but mostly because they want to nurture and stock the land for the farmers to come. Listening to Sarah and Hubert talk about Fine Line Farm and their plans I can’t help catching their excitement, not only about what they’re doing, but about the future of farming in this state. Their combined years of experience paired with curiosity, enthusiasm, love of the land, and a passion for food is good recipe for a solid farm future. A future that’s delicious. Check back next Wednesday for the amazing spring greens risotto recipe inspired by Sarah and Hubert. . .